Imphal, Sep 21 : A 12 kilometre stretch of Tamenglong-Azuiram road which was damaged due to heavy rain and multiple landslides and had remained cut off for nearly three months in remote Tamenglong district, has been repaired and restored by the Indian Army. The repair work was carried out by Army's Tamenglong Battalion of Senapati Bridge under the aegis of Red Shield Division with the help of local people, a Defence press release said on Saturday. 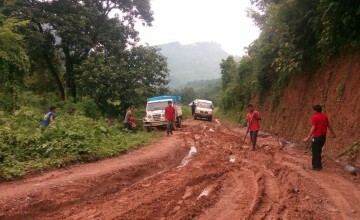 The Tamenglong-Azuiram road which was closed for about three months due to natural calamities like heavy rain and multiple landslides, has been restored connectivity this weekend and people of remote Azuiram village could go to their district headquarters, Tamenglong now, the release added. People of Azuiram village expressed their gratitude and happiness to Indian Army for such untiring dedication to reach out to local populace, said another press release issued by the Chairman of the village authority of Azuiram.